My Q on a Century at Lords has now been answered… Ajinkya Rahane joined the elite list of 8 others making a Century at Lords… Rahane has earlier made one in New Zealand in that test where Brendon McCullum made a triple…. His 2nd in 7 matches ~ coming in at a time when India struggled on a slightly green top. India lost Dhawan at 11; Vijay at 48; Kohli at 86 and were 128/6 when Jadeja left and 145/7 – Stuart Binny .. then came a 90 run partnership of Rahane with Bhuvi. Read an interesting report on a player who badly wants to play Cricket again,………… that is Zimbabwe’s Mark Vermeulen whose life and career changed forever on January 20, 2004, when he was struck a sickening blow on the head by Irfan Pathan, during Zimbabwe's VB Series campaign in Australia. India, embarked the present tour trying to erase those bad memories of 0-4 loss on their last tour to England; at Trent Bridge held a reasonable draw…….. here they struggled before Ajinkya Rahane brought some respect before succumbing at 103. While others failed to pace (mainly to Anderson, who moved the ball so well) – Jadeja offered his pads without reading Moeen Ali – so much at sea. The inquiry into England fast bowler James Anderson's alleged involvement in the incident with Ravindra Jadeja will begin on July 22, a day after the scheduled conclusion of the ongoing second Investec Test at Lord's. ICC has appointed Gordon Lewis, Australia's representative on the ICC Code of Conduct Commission, as the Judicial Commissioner to preside over the hearing. He will also hear the charge against Jadeja. Lewis was also the commissioner for David Warner's hearing into the Joe Root incident. With the tour of Men, Indian Women will play their first Test match in England – coming as it does after 8 long years. Of all the players in the 15-person squad, only Mithali Raj, vice-captain Karuna Jain and medium-pacer Jhulan Goswami have any Test experience. All three featured in India's last Test match, a five-wicket win over England at Taunton in 2006. From 1976 to date, the team has played 35 Tests. 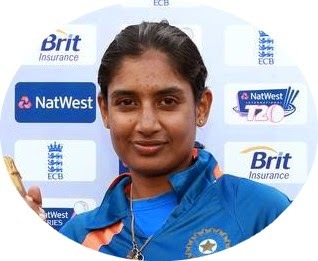 Mithali 31, has played 148 ODIs since making her debut in 1999 but has featured in only eight Tests ~ and she scored a 214 in one amongst them at England. She naturally yearns for more test matches. Coming back to Mark Vermeulen - his life and career changed forever after that blow on head by Irfan. Two-and-a-half erratic years later, in October 2006, he was arrested………….. He was left out of national squads and could not bear his exclusion. That October, after he saw the team he was not part of training at the Harare Sports Club, he tried to burn the club down. But his attempt went only as far as the club's curtains. Someone spotted the smoking drapes and the fire was put out. The next day Vermeulen targeted a smaller but no less significant target: the national academy. That time the sparks spewed over everything from cricket kit to computers. Vermeulen was arrested shortly afterwards, but was cleared at his subsequent trial in January 2008, on the grounds that he had been suffering psychiatric problems, including partial complex epilepsy, ever since the injury. That seemed to signal the end of his career, but he refused to accept that and his perseverance was rewarded in 2009 when the Zimbabwe board agreed to offer him another chance.